The new Student Services and Admissions Center (SSAC) houses Admissions, Records and Scheduling, Business, Financial Aid, and MT One Stop (1). This 58,000 square-foot facility has a bridge that connects a parking garage to the SSAC and the Student Union. Current and newly admitted students can talk to an enrollment counselor at MT One Stop for information about financial aid, scholarships, records and scheduling, bills, transcripts, holds, and much more. Next to the SSAC is a parking lot for visitors. The Health, Wellness, and Recreation Center (2) has six racquetball courts, six basketball courts, an indoor track, cardiovascular and weight rooms, two aerobic rooms, indoor and outdoor pools, a rock-climbing wall, an outdoor ropes course, and an indoor soccer facility. A variety of activities are offered almost year-round: aquatics, fitness, intramurals, sport clubs, adaptive recreation, and outdoor adventures. Health Services is located inside the Recreation Center and has a full-service pharmacy. Across the street from the Rec Center is the Paul W. Martin Sr. Honors Building (3), with its stately bell tower. In the Martin Building, students study, work on Honors publications, enjoy a free cup of coffee or newspaper, or just relax by the fireplace in the commons. Honors courses are capped at 15–20 students. When an Honors thesis is completed, bells peal to announce the achievement. The Honors College offers Buchanan Fellowships, the highest award given to entering freshmen. The College of Media and Entertainment is one of the largest of its kind in the country and is the only college in the U.S. with a recording industry program and other offerings in media. The Center for Innovation in Media (4) houses offices for Sidelines, the student-run newspaper; WMTS-FM, a student-run radio station; MT Records, a student-run record label; MT10, a student-operated cable television station; and WMOT-FM, a 100,000-watt public radio station. Outside the building you may see the Mobile Production Lab (5), “The Truck,” if it is not away covering an event. The high definition video production lab is the most advanced mobile production lab independently operated by any university in the country. James E. Walker Library (6) is named after the University’s eighth president. The library contains close to 1 million books and periodicals and provides access to over 200 databases. The University Writing Center is a resource that assists students in writing and editing papers. The Digital Media Studio (DMS) provides Macs and PCs with specialized media software, plus now offers a Makerspace—taking the creative design focus of the DMS to another level. This new learning experience is introducing the campus to computer-aided design technology and fabrication equipment. Students from all disciplines can find innovative ways of bringing their ideas to life. Several study rooms are situated throughout the library. Feel free to explore. Next to the library is the new state-of-the-art Science Building (8). With more than 250,000 square feet of classrooms, student research laboratories, faculty offices, and collaborative learning spaces for the more than 13,000 students who enroll annually in biology, chemistry, and other science courses, the Science Building is the biggest improvement ever for science education and research at MTSU. Ahead you will see Davis Science Building and Wiser-Patten Science Hall, which were renovated and reopened in 2017. These buildings, which comprise the new Science Corridor of Innovation along with the new Science Building, house the departments of Geosciences, Physics, Astronomy, Forensic Science, and the College of Basic and Applied Sciences Advising Center. Continue north toward the Business and Aerospace Building (9) and turn left on the main sidewalk. As you walk west on the main sidewalk, you’ll pass McWherter Learning Resources Center, home to the Department of Human Sciences and the Center for Educational Media. Continue walking west on the main sidewalk. The area south of Keathley is known as the KUC Knoll. Keathley University Center (10) contains various offices, including Housing, CUSTOMS orientation, the post office, and a food court. Just west of Keathley is Todd Hall. Todd is the home of the Department of Art and administrative offices of the College of Liberal Arts. The building has dedicated areas for various branches of the visual arts, a student gallery, Todd Art Gallery, and classrooms. West of Todd Hall, between Peck Hall and the Cope Administration Building, is Walnut Grove (11), a place for tailgating before football games. The walnut trees were grown from nuts brought from George Washington’s Mount Vernon home in Virginia. Ahead are residence halls including Miss Mary, Lyon, McHenry, Reynolds, Monohan, and Schardt. The Blue Horseshoe in Walnut Grove (12) is a symbol of luck. A penny from 1911, the year the institution was founded, is buried beneath it. Also ahead is James Union Building (13), which has an all-you-can-eat cafeteria, the Tennessee Ballroom, and several offices. The Raider Walk next to Peck Hall is where the football team meets with fans before home games. Peck Hall has many nicknames, such as the freshman maze and Bermuda Square, due to the layout of the building. Continue north through Peck Hall to Kirksey Old Main. You are now standing where everything began at MTSU in 1911. In the beginning, Kirksey Old Main (14) was the classroom building, Rutledge Hall was a dormitory, and the Tom H. Jackson Building was the original dining hall. Kirksey now houses the Departments of Computer Science and Mathematical Sciences. Jones Hall (15), the original male residence hall, now contains administrative offices for the College of Basic and Applied Sciences, Liberal Arts Advising, and the Department of Psychology. Continue walking to the right of Kirksey Old Main until you are on the corner of Normal Way and MTSU Boulevard. Behind KOM you will see Voorhies Engineering Technology Building, which houses Concrete and Construction Management and Engineering Technology. Look toward Johnny “Red” Floyd Stadium (16), the home of MTSU football, and you will see the scoreboard. MTSU belongs to Conference USA and has 17 Division I teams. Murphy Center (17), or “The Glass House,” is our basketball arena. Alumni Memorial Gym is where the women’s volleyball team plays. Reese Smith Jr. Field (18) is home to Blue Raider baseball. Dean A. Hayes Track and Soccer Stadium is at the corner of Greenland Drive and Champion Way. 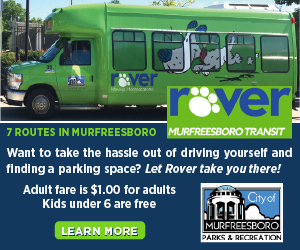 The softball field is on the opposite side of campus on MTSU Boulevard next to the Rec Center. As you walk east on MTSU Boulevard, the buildings you see on your left are dedicated to the fine arts. Saunders Fine Arts and the Wright Music Building house the School of Music. MTSU’s Band of Blue is one of the largest collegiate marching bands in the nation with close to 400 members! Many concerts and other performances are held in Hinton Music Hall in Wright Music Building. Boutwell Dramatic Arts Building contains Tucker Theatre (19), where many performances are held each year. Also in Boutwell is the Department of Foreign Languages and Literatures. To the right of Boutwell Dramatic Arts is Forrest Hall, home of the Department of Military Science and MTSU’s ROTC program. The first building on your left is Cason-Kennedy Nursing Building (20), which has state-of-the art classrooms, two large computer labs, seven nursing skills training labs, an obstetrics lab, a pediatric lab, an IV skill-specific lab, and a high-fidelity simulation lab. The Stark Agribusiness and Agriscience Center (21) houses such programs as Agribusiness, Animal Science, Horse Science, and Plant and Soil Science. Off campus, the school has a horse science center, farm laboratories, and a dairy. The Business and Aerospace Building (9) contains the Jennings A. Jones College of Business, the Aerospace Department, and the largest computer lab on campus. The Aerospace Department (22) has a 360-degree air traffic control simulator and flight operation center on campus. At nearby Murfreesboro airport, there is a hangar, several simulators (including one with an actual glass cockpit), a small jet (CRJ-200) flight simulator, and over 30 airplanes. Also to your right are Cummings Hall and Corlew Hall, our First-Year Experience residece halls, which are exclusively assigned to first-year students. McCallie Dining Hall is on the first floor of Corlew. Continue down MTSU Boulevard toward the Student Union Building. You will pass the College of Education Building (23), which is home to Early Childhood Education, Interdisciplinary Studies, Secondary Dducation, and Special Education. Students can use TeamSpot/ClassSpot, collaborative software that allows the sharing of documents wirelessly. The building’s atrium features the Tennessee Teachers Hall of Fame. On the first floor of the new Student Union Building (24) are the campus bookstore, a game room, the Blue Raider Grill, and several other dining options. The second floor features a ballroom, computer lab, conference rooms, study rooms, a video theater, and the parliamentary room of the Student Government Association (SGA). The Center for Student Involvement and Leadership, Student Programming, and SGA offices are on the third floor. 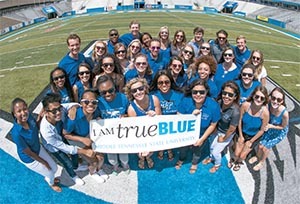 MTSU has over 300 student organizations.